IA Design was engaged by Wray’s Legal (Wray’s) to complete test fits for three different tenancies that maximised the potential of each building. This was to ensure that Wray’s chose the best possible tenancy solution for both business operation and staff satisfaction. 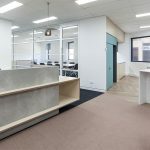 IA Design was successful in winning the design and delivery of the project and delivered Wray’s new workplace within the chosen building, level 7, 863 Hay Street. IA Design underwent extensive workplace strategy briefing and change management during the initial project definition stage to develop a strategy and concept for Wray’s that would ensure that the final outcome would be the right outcome for them and their requirements. The design team and internal Project Director interrogated Wray’s requirements through intensive briefing strategies such as accommodation questionnaires asking what works, what doesn’t, how staff want to feel and what culture they would like to have permeate throughout the new design. Essentially teasing out how Wray’s new environment can enhance the way the business works and how the employees feel within the environment. IA Design developed an integrated transition plan to ensure the changeover went smoothly for all involved. This plan included an initiating phase, planning phase, implementation phase, execution phase, relocation phase and closing phase outlining all process and procedures that needed to be implemented and developing the initial Brief. The design team selected finishes and materials that were reflective of a lawyer firm whilst ensuring the fit out would be contemporary and thoughtful of Wray’s branding. They also integrated innovative, flexible and mobile techniques and work spaces that would maximise space usage within the fit out. The final design is a successful outcome that supports Wray’s operational requirements and has impacted the way employees work.